Is anyone reading? I have a challenge for you…please comment! Just this once, pretty please? It can be as simple as where you live or as detailed as how you stumbled onto my corner of the internet. I was inspired all those years ago by Stephanie Pearl-McPhee aka The Yarn Harlot. In January 2006, she came up with the idea for the Knitting Olympics. I was working two days a week at my mom’s quilt and knit shop, so I thought I would join in. I made a bag, started blogging about my crafts, and here we are. I began blogging on yahoo, then moved to BlogSpot, then moved here to the wordpress format. 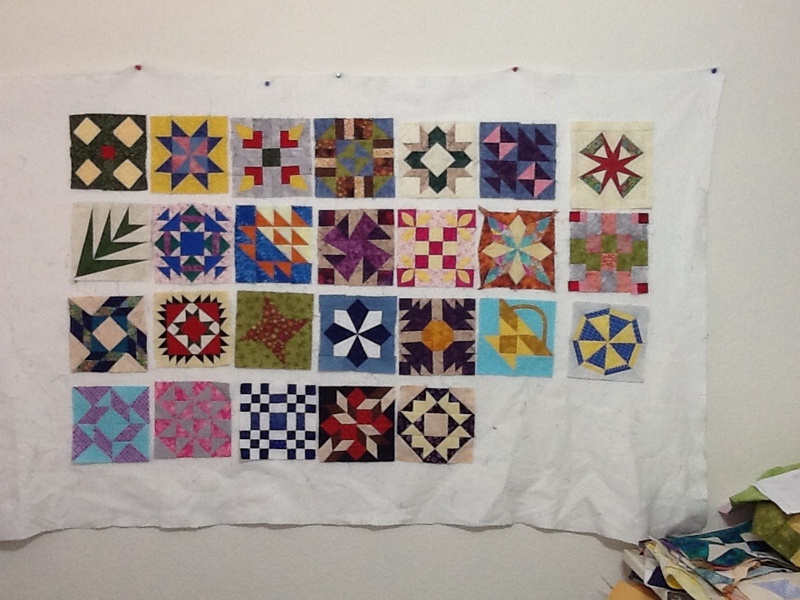 I mostly talk about my quilts and knit projects. My blog was launched at the same time we started the adoption process and around the same time as I bought a longarm quilting machine. The blog has been the perfect scrapbook for all of those adventures! I was not shy about showing my beautiful baby, and I shared many quilts and knits, in every stage of the process. Think about how the internet has changed over the years. I blogged before Ravelry! I blogged before Facebook! Now there are sites like pinterest, instagram and Craftsy. All of these are such great places to find inspiration and share the excitement of a finished project. My crafting and blogging time have dwindled a bit, which is a natural by-product of life with an active family and a pesky day job. But I still feel the need to document my projects, and share them with you. Thanks for listening! Pictured are half the blocks for my Women of the Bible Quilt. I can’t remember where I first saw this project, but there is a large yahoo group devoted to making blocks and reading the year long devotional by the same name. If nothing else, I spend an hour or so each week making the block and writing a tutorial since a friend and I are having a mini-quilt-along this year. One of those trends from the heyday of blogging all those years ago was the popularity of memes, so I will resurrect an easy one. Twenty Years Ago, I was an Air Force lieutenant stationed at Cannon AFB, New Mexico.